The other day I went to one of my favorite places of inspiration...Scavenger's Paradise. 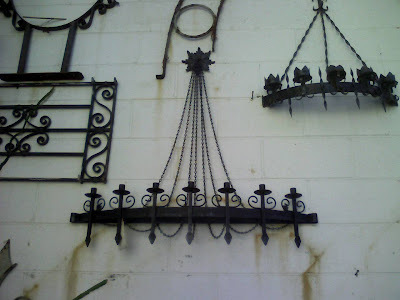 It's an architectural salvage store that is located in an old church building. The outside is scattered with fountains and doors, while the inside has furniture and decor. I found this great candle sconce that I am considering for my house. I was also thinking that the shop would make a great location for our upcoming photo shoot, but come to find out, I am not the only one who thinks so. Gilliam, the very kind and lovely owner, informed me that they are a popular spot for filming and photo shoots and generally charge $2500 a day. Maybe someday when Salvage Life hits the big time...in the meantime, I'll keep dreaming.